A cast of ear wax after removal. Ear wax is a normal product of the ear which protects the skin of the ear from water and infection. Ear wax is formed from wax glands in the external ear canal as well as other components such as dead skin, sweat, and oil. The primary component of ear wax is keratin (derived from dead skin). Ear wax thus differs slightly from cerumen which is the secretory product of the ceruminous glands in the external auditory canal (Hawke, 2002). While ear wax is generally simply felt to be a nuisance, in medieval times, ear wax was used as a component of pigment for illumination of manuscripts (Petrakis, 2000). Anthropologists have used cerumen type to tract human migratory patterns and epidemiologists have related cerumen type to breast cancer. (Roeser et al, 1997). Different individuals vary considerably in the amount and consistency of their ear wax. There are two types described, wet and dry, which are inherited. Dry wax is common in Asia, while wet wax is common in western Europe. Dry wax, also known as "rice-bran wax", contains by weight about 20% lipid (fat). Oddly enough, rice-bran wax is associated with a lower incidence of breast cancer (Hawke, 2002). According to Japanese researchers, a gene known as ATP-binding casette CII is important in controlling the type of ear wax you have. Without the contribution of this gene, one has dry (rice-bran) ear wax. (Yoshiura, Kinoshita et al. 2006). The high prevalence of dry wax may account for why the Japanese have so many ways of removing it (i.e. mimikaki). Wet wax consists of approximately 50% fat (Burkhart et al, 2000). Wet wax can be either soft or hard, the hard wax being more likely to be impacted. Too little ear wax increases the risk of infection (Fairey et al, 1985). Too much wax also increases the incidence of infection and hearing loss. So, you want just enough. While we are not aware of a study of this, some people (and some ears) are "wax producers", and others remain wax free without much maintenance. This has some impact on ear wax management (see below). Two populations are known to have a high incidence of excessive/impacted cerumen: individuals with mental retardation and the elderly. (Roeser et al, 1997). 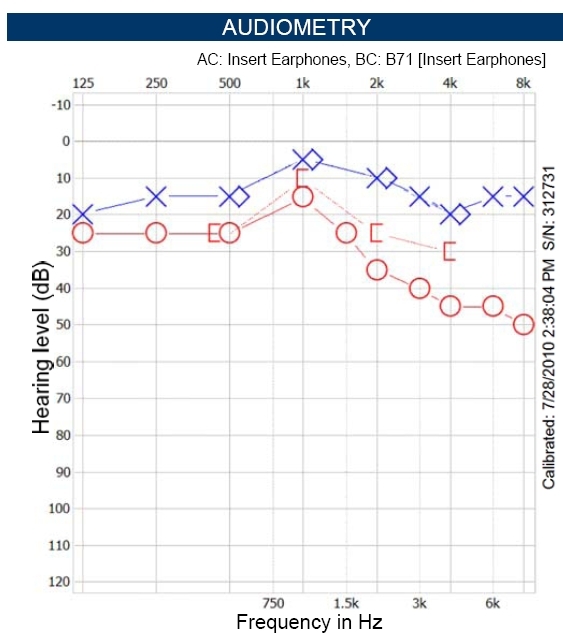 Audiogram prior to ear wax removal (decreased hearing at both low and high pitches on the right (circles) compared to the left (x's). 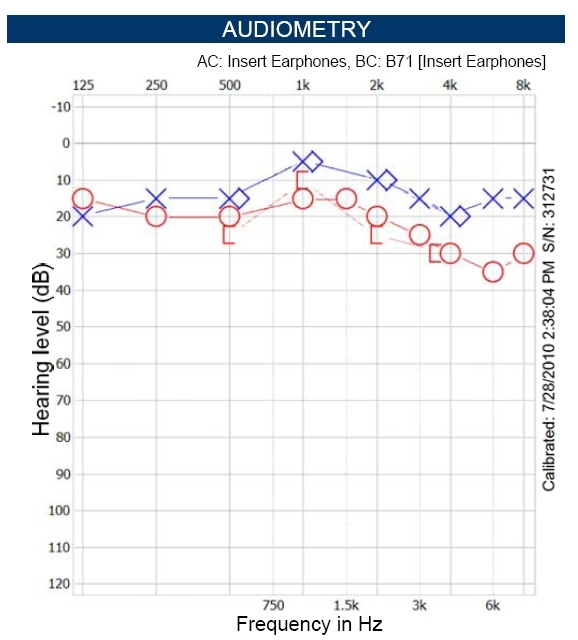 Audiogram after ear wax removal. What can go wrong with ear wax ? Wax can plug up the ear, causing hearing to be reduced, and a full feeling in the ear. This is called an "impaction". About 2-6% of the population has an ear wax impaction at any time. An example of the effect on hearing is shown above. Wax can trap bacteria or fungus or other stuff in the ear, leading to infection. This is usually painful or at least itchy. 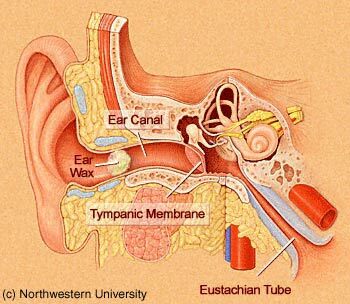 Ear wax can obscure vision when the doctor looks in your ears, possibly hiding a dangerous process. How does one know one has ear wax ? Direct vision is the easiest way. 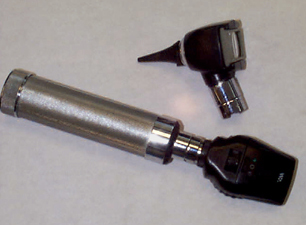 An otoscope is used to visualize the wax. How is ear wax treated ? Problematic wax can be removed with drops, with water jets ("irrigation"), with suction, and with instruments by a doctor, audiologist or trained technician. If a person has chronic ear disease, a perforation of the ear drum, or has wax in their only hearing ear, it is recommended to have wax removed by an ear doctor under direct vision. If there is a perforation in the ear drum, or a reasonable possibility of a perforation, wax should be removed by instruments and/or suction, and not by irrigation. The best way: removal under direct vision by a doctor or other professional is the best method of getting wax out, but it requires a doctors visit and the doctor must have access to an examining microscope. Practically speaking, this generally requires yearly visits to see a specialist called an "otologist". The ear doctor will remove wax with a cerumen spoon, or suction, or both. This method may be a little painful - not awful -- but not entirely pleasant. The reason is that wax is often embedded into the hair that grows onto the side of the ear canal. When one takes the wax out using a cerumen instrument, hair often comes with it -- this can hurt. This particular problem can be avoided by softening up the wax first with some oil (we often recommend Debrox) -- or by irrigating it out (see below). In persons who have a very large amount of ear wax, putting drops into the ear may simply block up the ear and make it wet. Because of this consideration, the optimal method of doing this is to have someone look into your ear first, and act depending on the situation. Moderate amount of wax -- take it out with microscope. Recheck in 6 months. Large amounts of hard wax -- take out as much as can be easily removed with microscope, and have person use drops, return in a few days to a week for suction. Recheck in 3 months. Large amounts of wax, already soft. Take out with suction or irrigation. Recheck in 3 months. Irrigation or "syringing" is a standard method of wax removal and approximately 150,000 ears are irrigated each week in the United States (Grossan, 1998). To avoid inducing dizziness, body temperature water is preferred. While irrigation is a conventional and accepted method of ear wax removal, it has many disadvantages compared to removal under direct vision. For example, in the rare instances when there is a perforation under the wax, irrigation may force water and wax into the middle ear, causing a nidus for infection. Irrigation also puts the ear to risk for bacterial infection. Some authors recommend placing 1 or 2 drops of Domeboro, Vosol or Cortisporin otic in the irrigated canal to prevent infection. 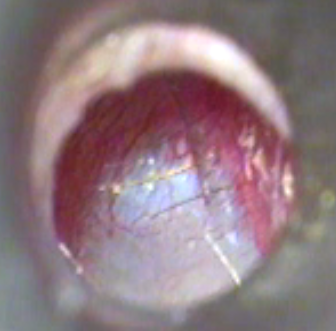 Irrigation should not be used in ears with perforations. 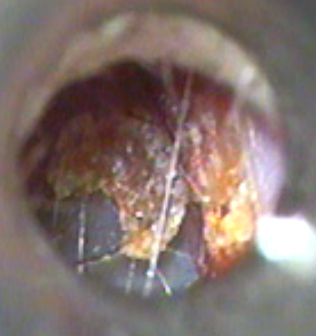 Sometimes ear wax is hardened and impossible to remove with irrigation. In this situation one may attempt to soften the wax with oil and return in one week for another attempt. Suction may be helpful in this situation. Water jet devices such as used for dental care have also been used for ear wax removal. While generally effective, this method is judged unpleasant by many patients. There is also danger of perforation of the ear drum using these devices. Special tips can be used to reduce or eliminate this risk. The Welch Allyn Ear Wash System simultaneously irrigates and suctions out water and wax in a single step. This system is used in our practice in Chicago, and is very well tolerated. We also have a video otoscope that allows people to see their ear wax, "in situ", on a very large monitor. This is just if you really want to see whats in there. With respect to using drops, the current literature is inconclusive and basically suggests that nearly anything wet works as well as anything else. Over the counter drops that help remove wax are largely basically water, oil and peroxide solutions (e.g. brand names are Debrox). Among the solutions are ordinary water, 10% sodium bicarbonate, 3% hydrogen peroxide, 2% acetic acid, and a combination of 0.5% aluminum acetate and .03% benzethonium chloride (Hawke, 2002). Hydrogen peroxide is present for the mechanical effect -- of course it does not dissolve ear wax (Burkhart et al, 2000). These preparations are best for those with small to moderate amounts of wax. Among oil-based organic solutions are olive oil, glycerin, propylene glycol, and others. Warming of solutions used for wax removal sometimes is helpful. According to Hawke, oil based preparations basically do nothing but lubricate (Hawke, 2002). Some preparations are enzyme based. We advise against use of "enzyme" based preparations, because of problems with allergy. NONE OF THESE PREPARATIONS SHOULD BE USED IN PERSONS WHO HAVE A EARDRUM PERFORATION. In many patients, a wax plug blocks the ear so one cannot know for sure if a perforation is present. However in this situation, it is usually possible to make an educated guess with a reasonable degree of reliability (Hawke, 2002). There are also preparations intended to dissolve ear wax -- for example, Cerumenex Ear Drops and Murine Ear drops. Neither of these preparations are any better than salt water. This is not to say that they are worthless -- just that salt water is equally effective (Roland et al, 2004). Colace (a liquid stool softener), having the active ingrediant of docuate, when dropped in the ear, has also been studied for ear wax control. It has not been shown to have any advantages or disadvantages over other preparations. (see Cochrane Review). Docusate is ototoxic in guinea pigs (Nader et al, 2011), and for this reason, should be especially avoided when there is any chance of a perforation. Dermotic drops are a mixture of oil and steroids. They can be used for itchy ears. They are not useful for ear wax per se. "Candling" is an "alternative" method of removing wax. This method is not felt to be effective. There is an obvious risk of burning your ear. First, one should realize that wax isn't all that bad. It keeps your ear dry and helps prevent infection. So, you don't want to eliminate wax, but just keep it from blocking your ear. How can one keep wax from blocking the ear ? There are several methods. The first two involve putting liquids into the ear, and should not be used by people with a hole in their ear drum (perforation). One method is to put baby oil or olive oil into the ear on a regular basis. Put in the drops, let it sit in there for a few minutes, then lie down on a towel to let it drip out again. Probably only a few drops every week in each ear is good enough (nobody has done a research study on this). It doesn't hurt to put a few drops of clean olive oil or baby oil into each ear every day. Swimmers often do this prior to their daily swim. However, be sure that the oil is clean, as you don't want to introduce bacteria. 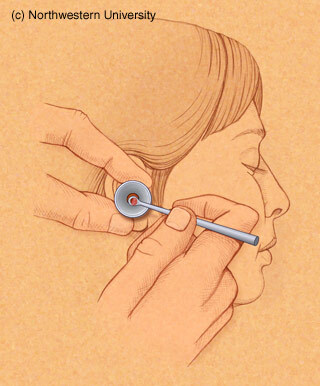 This should not be done if you have an eardrum perforation or if you don't know whether or not you have a perforation. A second method is to have one's doctor prescribe a 60 cc bottle of Domeboro otic and place 2 drops of this solution into their ear weekly after showering. The Domeboro solution supposedly stimulates migration of wax out of the canal. We don't know of a study that proves that this is really true though. Another method is to have your ear cleaned out by your doctor on a regular basis. Everyone builds up wax at their own rate, but commonly people need to come back for wax removal at 6 month or 1 year intervals. When cotton tipped applicators are used to clean out ear wax, there is a risk of breaking the ear drum (perforation). Although we realize that this is commonly done, we recommend against using cotton tipped applicators, hair pins, and similar devices to clean the ear. We recommend against using cotton tipped applicators (the so-called 'Q' TIPS) as well as putting other things into your ear such as hair pins. This can be dangerous because you run the risk of breaking your ear drum ("perforation"), as well as jamming wax deeper inside. Nonetheless, some people use Q-tips without apparent harm. If you do use them anyway, in spite of the official recommendation against doing so, caution is advised as well as limiting use to once per week. Bankaitis AU, Kelso S. Cerumen Management. Oaktree Products. Roeser, R. J. and B. B. Ballachanda (1997). "Physiology, pathophysiology, and anthropology/epidemiology of human earcanal secretions." J Am Acad Audiol 8(6): 391-400. Yoshiura, K., A. Kinoshita, T. Ishida, et al. (2006). "A SNP in the ABCC11 gene is the determinant of human earwax type." Nat Genet38(3): 324-30.